The Rosetta comet-chasing probe will pass another waypoint on its circuitous route to destiny Friday, making a final visit home before being thrown into deep space to meet the mission's icy target. The European robotic spacecraft will skim 1,542 miles above the Indonesian island of Java at the point of closest approach at 0745 GMT (2:45 a.m. EST) Friday. Rosetta's relative speed with Earth during the encounter will be almost 30,000 mph, according to the European Space Agency. The flyby will use Earth's gravity to alter Rosetta's trajectory and set the spacecraft on course to rendezvous with an object called Comet 67P/Churyumov-Gerasimenko in 2014. 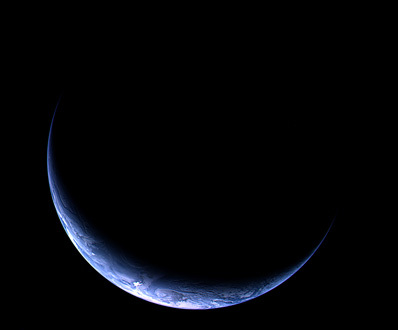 Friday will mark the third time Rosetta has encountered Earth since its launch in March 2004. Rosetta also flew by Mars in 2007 for another gravity assist maneuver. Rosetta has already traveled nearly 2.8 billion miles since launch. The $1.5 billion, 11-year-long mission will have traveled more than 4 billion miles when it arrives at Churyumov-Gerasimenko. In addition to the critical orbital mechanics objective of Friday's flyby, scientists are powering up Rosetta's suite of instruments for calibration tests and observations of the Earth and the moon. "The Earth swing-by of Rosetta provides one of the rare opportunities to observe the Earth and the moon with instrumentation not currently in orbit around the Earth," said Rita Schulz, Rosetta's project scientist. Rosetta could help unravel a puzzling mystery involving very small unexplained variations in speed affecting spacecraft swinging by Earth bound for interplanetary missions. Some spacecraft flying by Earth previously have experienced speed changes slightly different -- on the order of millimeters per second -- than engineers predicted. See Astronomy Now's full story on the cosmic anomaly. Rosetta's optical, spectroscopic and infrared remote imaging system, or OSIRIS, instrument was turned on last week to begin collecting pictures of the Earth and moon throughout the flyby. Gerhard Schwehm, Rosetta's project manager, said the camera will try attempt to take pictures of regions around New York and Berlin. OSIRIS already downlinked images of the Earth and moon as the probe approached over the last few days. A team of researchers has also been dispatched to ESA's Optical Ground Station in the Canary Islands to shoot a laser beam into space on three nights this week. The experiment is aimed to see if Rosetta's narrow-angle camera can resolve the pinpoint of light. A microwave instrument called MIRO will turn its aperture toward the moon to attempt to look for signs of water vapor at the lunar north pole. "I hope to be able to see water vapor with the MIRO spectrometer, however, I will be very surprised and happy if (we) do," said Sam Gulkis, the instrument's principal investigator from NASA's Jet Propulsion Laboratory. Gulkis said he requested the observation time before scientists announced in September the discovery of small concentrations water and hydroxyl molecules on the moon. Those findings were made by sensors on India's Chandrayaan 1 lunar orbiter and the Cassini and Deep Impact spacecraft stationed further away from the moon. "For many years, there had been speculation that unilluminated craters on the moon might contain water ice," Gulkis said. "Our calculations suggested that we would not have enough sensitivity to detect water vapor from the sublimating ice within the craters." Regardless of whether MIRO detects water vapor, the instrument should give scientists a limit on how much or how little water vapor is present at the north pole. "If the ice is more widely distributed on moon than I had originally imagined, the possibilities for detecting water could change," Gulkis told Spaceflight Now. "To be clear, failure to detect water with the MIRO instrument should not be taken to infer that anything is wrong the reports (in September)." 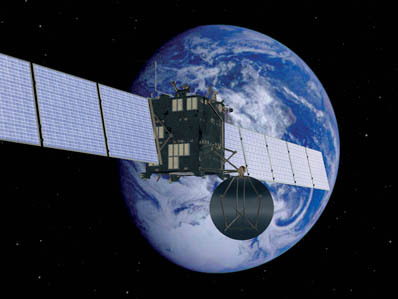 Rosetta's ALICE payload, an ultraviolet imaging spectrometer, will search for Earth's auroras and study the atmosphere. The craft's plasma-detecting instruments will also study the magnetosphere as Rosetta flies through Earth's radiation belts, according to Schwehm. "The Earth and the Moon can be observed at wavelengths not accessible by ground-bases telescopes, because either the Earth atmosphere is opaque at these wavelengths or the compound searched for is part of the Earth atmosphere and can therefore not be distinguished, (such as) water on the moon," Schulz said. Next on Rosetta's journey is a flyby of asteroid Lutetia on July 10, 2010. "We expect this flyby to provide us with excellent scientific data on this asteroid, which will be the biggest asteroid visited by a spacecraft," Schulz said. Rosetta will fly less than 2,000 miles from the 60-mile-wide asteroid, according to ESA. After the asteroid encounter, Rosetta will be put into hibernation in 2011 for almost three years. This involves shutting down most of the probe's systems to reduce wear-and-tear and extend their lifetimes. "It is like with a baby, do not disturb them when they should fall asleep, otherwise they get excited about any distraction," Schwehm said. "Then the time really starts for us to prepare the comet phase in detail. You can be sure that all the team will think about our baby all the time until it will wake up in 2014 again." Controllers will wake up Rosetta in January 2014, four months before its first encounter with Churyumov-Gerasimenko on May 22, 2014. Rosetta will next enter orbit around the comet and drop a small lander to Churyumov-Gerasimenko's nucleus in November 2014. The spacecraft will accompany the comet during the perihelion phase of its orbit, or when it is closest to the sun.